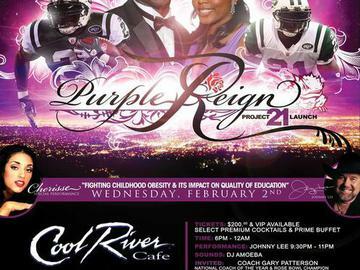 Grey Goose & Cool River Presents LaDainian Tomlinson's Purple Reign! Hosted by LaDainian Tomlinson, Teammates and Friends as he celebrates his TCU Horned Frogs stellar Rose Bowl Season raising funds to fight Childhood Obesity and its Impact on Quality of Education. Entertainment: Johnny Lee & DJ Dr. Amoeba!